Many thanks to everyone who helped raise over £400 for R.E.S.T. (Rare & Endangered Species Trust) following a mass poisoning of over 1000 endangered Cape Griffon vultures. However, the folk at R.E.S.T. need your help again. 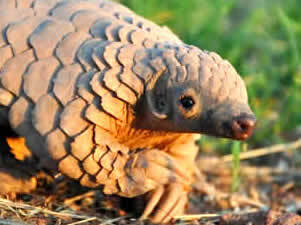 They have started a crowdfunding site at www.indiegogo.com/projects/help-save-the-pangolin to raise funds for a new base. Please take a look at the site & make a donation if you can. You can also donate directly any amount by going to their website below. If you can help in any way, or know of any businesses that could help with the rescue effort, please get in touch. Africat are collecting donations for R.E.S.T. as they are having trouble setting up their PayPal donations button. If you wish to donate via Africat, please use the donate button below. Pangolin Hello, Donna here. I just wondered if you could all take a look at the fabulous work being done by Maria and co. over in Africa. I am looking into ways which we may be able to help with a little fund-raising. If you feel you can help please get in touch. At the moment Maria is nursing a very rare animal called a Pangolin. Please take a look at these poor animals in Greece. If you can spare a few quid, they could do with all the cash they can get. Chinchillas4life have managed to locate some very nice hay. I know how hard it is for our furballs to get nice hay they enjoy, at a good price. We are now using this hay and the chins are enjoying it. Our chins are eating both the meadow hay and the timothy hay. Both are nice and green and at a really good price. Please take a look and try for yourselves as our chins will benefit from you buying this hay. Chinchillas 4 Life rescues un-wanted and sick chinchillas. If possible, they are re-homed to suitable owners who can give them the love and care that they deserve. We will always do our best to never turn a chinny away. For information or advice, please contact us. 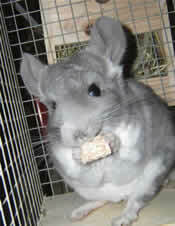 We usually have chinchillas of various ages that are ready for re-homing. Please bear in mind that chinchillas are exotic animals that need specialist care and a quiet environment. They are not suitable pets for children. If you think that you are able to give a chin a home, then please give us a ring. Here at the rescue, we do our best to ensure that our chins are re-homed to 'forever' homes. We aim to castrate every male to help to control the number of unwanted chinchillas. If you have a chin that you can no longer care for, then please do not hesitate to contact one of our team. Please feel free to contact any of us for help or advice on any issue. We have added a news section to this page. Scroll down the page or click the link. If you are interested in re-homing one of our chinchillas, then please take a look around our site first. We have a basic guide available on our health pages as a starting point. We are no longer able to take in chinchillas for re-homing. The chinchillas that we still have in our care will live out their days with us. Many thanks to everyone who has helped us over the years. We urge anyone who is thinking of getting a chinchilla to research thoroughly before making such a long commitment. You are easily looking at 15 years or more and many well-meaning owners have given over their much-loved pets to us when their circumstances changed. The rescue centres are full of these chinchillas. We are still open for advice and information, so please contact us if you have any questions. Willie had only a short time with us but we know that he was happy... he really enjoyed his 15 minutes of fame in the South Wales Echo! Willie died peacefully at the grand old age of 22 and a half years. Some in a cooler hour. Willis lives with Jane and Chris Dyer in Cardiff. They think he is the oldest chinny in South Wales. Take a peek at the article in Wales Online. We have found another fabulous 'oldy'! Khali - 26 years old! She was bought from a pet shop in Shrewsbury in June 1983. She now lives with another two old ladies aged ten and twelve respectively in a large indoor inclosure. She has always had company but friends have come and gone. She has been fed on pellets and hay all her life and is very keen on dried apple slices. She is a lovely tame old lady and still jumps around the enclosure as quickly as her friend. We picked up this 'girl' Cilla today. He (underneath the matts she turned out to be a he!) was kept outside in a hutch. He was damp and stressed as kids were tormenting him and throwing stones at him. He wasn't given any hay and was not properly fed. He was given builders sand to roll in. A very kind neighbour managed to rescue him a few days ago and has tried her very best, even buying him a cage and all the things to go in such as a hammock and dustbath. She could not keep him so got in touch with us. We have just cut off a few of the matts that cover his body. It will take a few more days to completely de-matt him. Here are a few pictures and a short video to show how bad he was. We will add more when we get some time. We were worried about the way that he was eating last night, so we decided to get him checked out at the vets. He has had xrays this morning (and a final de-matting whilst anaesthetised) and sadly they have confirmed that he has malocclusion. Through our experience, this could be due to a poor diet, stress and lack of gnaw chews and stimulation. He does not appear to be in any discomfort at the moment so we will keep a very close eye on him and make sure that he has a full and happy life for the time being. We are making sure that he is very spoiled and are giving him plenty of seasonal mix and twigs to chew on. He is now eating like there's no tomorrow. He seems to be much happier now that his coat is cleaner and is free from matts. He is now grooming himself and enjoying his sand bath in proper chinchilla dust! Cilla is doing very well and is looking much better. As you can see he is fond of a mini shreddie and loves dried apple. He has his nose to the cage every morning when he smells my toast. He always gets a little piece of the crust to munch on. Sadly, Cilla has passed away. He was a beautiful, gentle creature who I believe appreciated the short time that he spent with us. He suffered from malocclusion, and though we tried our very best for him, years of neglect took their toll. Cilla had to go to the vets to have his teeth burred down at the end of August. Sadly he would not eat hay or anything which would help to keep his teeth rasped. Unfortunately on Monday this week, a week after his operation, he was still not doing too well. We took him back and he had another X-ray and they took a look in his mouth while he was under. Sadly it seemed to be a tooth root abscess and we had no other option than to let him go. We are very sad to say goodbye to Cilla, he was a very special chinchilla and will not be forgotten by any of us. Sugar was already an old lady when she came to us, and has now reached the grand old age of 25. She's still one of the liveliest and friendliest in the rescue. We think that she must be one of the oldest in the UK - drop us a line if you know of an older chinny. Many thanks to Lucy from Huddersfield for adopting Sugar. If you want to adopt one of our long term residents, then please get in touch. You will receive a certificate and some goodies to thank you and you can rest assured that it will help to care for your chosen chinny. I post this with great sadness. Yesterday, when I went to see the chins, I found my old girl peacefully in forever sleep. Sugar was, as far as we know, the oldest chinchilla in the world at 25 years old. She was very very special and has lived a very long happy life. She was always very bright and bubbly and definitely the matriarch of the chin room. She has had a few near misses in her time and always pulled through. She was a beautiful old girl and very cheeky. Although she was not one for being picked up she would let you have a tickle until she had enough, then she would push you away and walk off ! She was always one of the first to the cage door when we go into the room. Always wanting to know what was going on. When we took Sugar on she had been in a barn where a rat had been terrorizing all the chins in there. The rat killed a baby, bit many of the chins and bit through one of the chins legs which was broken and badly infected (which we later had amputated). The rat also killed Sugars' 22 year old partner "Old Lad". Run free with "Old Lad" Sugar, you will never be forgotten. Sadly, we now believe that Bouncer has also passed away after a great, long life. Record Breaking Bouncer is now officially a world record breaking chinchilla, and has a certificate to prove it. 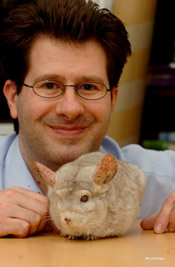 He is the world's oldest chinchilla. Bouncer was 27 years old on the 1st July! I think this now makes him the oldest chinchilla on record ever, as the only other one was recorded in America and died at 26. Three cheers for Bouncer! Bouncer was born on 1st July 1977 on a chinchilla ranch in Nottingham owned by Mr. Sweeney. We purchased him when he was 12 months old. He has had quite an uneventful life ( perhaps this helped towards him living to such an incredible age). He has moved house with us twice and coped well with the upheaval, and he has never been to the vets. This caused us some problems with his record attempt, it was difficult to prove his age as no vets had any details of him. Bouncer is not so fast on his feet as he used to be and no longer lives up to his name but apart from a cataract he is still fairly healthy. His secret to old age could be down to the fact he has never been overly pestered or over fed, he eats his routine pellets and hay and gets a treat of a couple of raisins most days. He has always been very good natured and handles well too.